As members of the University of the Philippines Kontemporaryong Gamelan Pilipino (Kontra-GaPi), a group that promotes indigenous music, Joy and Reg Cruz were able to bring home a lot of ethnic musical instruments like a hegalong and a kulintang. Now that they are educators, they have also started accumulating books and other reading materials. Their precious collections and other belongings have started to take over their modest home. In order to organize the small space, interior designer John Vigilia changed the old furniture layout, added more storage options, and chose more soft furnishings and decorative items. 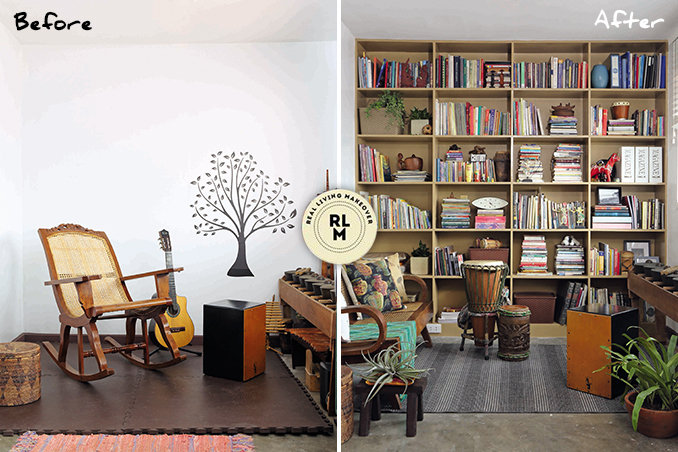 Read the original article ("Gone Native") in the August 2014 issue of Real Living Magazine. Download your digital copy of Real Living on the Real Living App now! Log on to summitnewsstand.com.ph/real-living for more details.